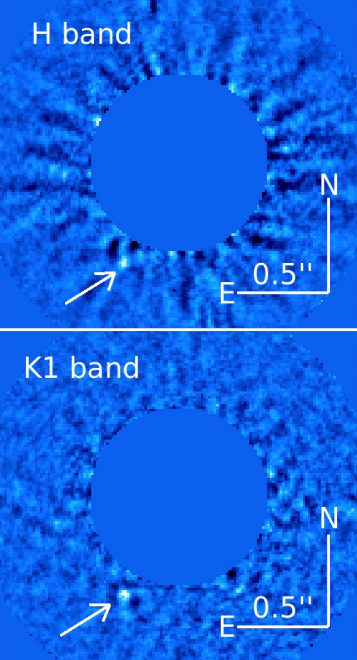 Figure 1 – Detections of the planet HD 95086 b at H band (1.7 microns – top), and K1 band (2.05 microns – bottom). Figure from Galicher et al. (2014). HD 95086 is a young A type star, approximately 17 million years old, that hosts a dusty debris disk. Last year, Rameau et al. directly imaged a planet around the star, HD 95086 b, at a projected distance of 56 AU. From the brightness of the planet in their observation at a wavelength of 3.8 microns, they calculated the mass of the planet to be ~ 5 MJup (MJup is the mass of Jupiter), making HD 95086 b the lowest mass exoplanet that has been directly imaged. Follow-up observations at shorter wavelengths were unable to detect the planet, suggesting it has a very red color, similar to the planets in the famous multi-planet system, HR 8799. In this paper, Galicher et al. use the newly commissioned Gemini Planet Imager (GPI) to successfully detect the planet at shorter wavelengths. The new observations are consistent with the old upper limits—the planet is extremely red, meaning it is brighter a long wavelengths. GPI is a new state of the art high contrast imaging instrument on the Gemini South Telescope in Chile. GPI combines adaptive optics to remove the effects of atmospheric turbulence, a coronagraph for starlight suppression, and an integral field spectrograph (IFS) to get spatial and spectral information simultaneously. HD 95086 b is one of the first exoplanets to be imaged with GPI as part of its commissioning observations. The results of the IFS observations are a spectral cube, a 2D image of the system at multiple wavelengths, giving three dimensions of information. The planet HD 95086 b, however, was too faint, so the data at all wavelengths were combined to increase the signal to noise. 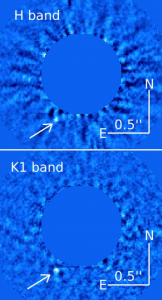 The final result of the data processing is two images of the planet at 1.7 and 2.05 microns (see Figure 1). The paper examines two years worth of observations of the planet to confirm that the planet is comoving with the star. 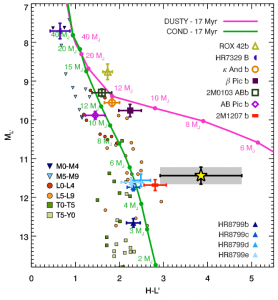 Figure 2 – Color – magnitude diagram of HD 95086 b (yellow star) compared to other exoplanets, M, L, and T dwarfs, and evolutionary models. Figure from Galicher et al. (2014). Figure 2 shows a color-magnitude diagram of HD 95086 b compared to other exoplanets, field dwarfs, and evolutionary models of planets and brown dwarfs. 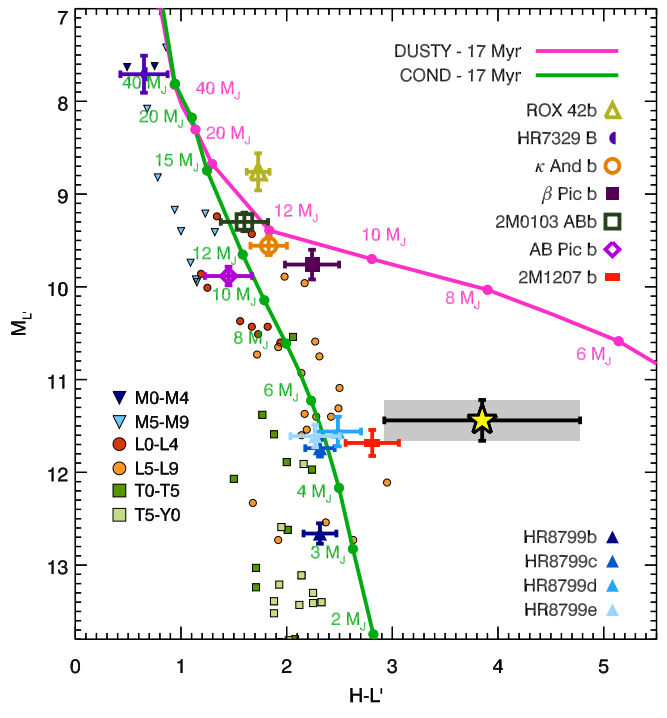 HD 95086 b lies in the transition region between L and T dwarfs, similar to the young planets HR 8799 c, d, and e. HD 95086 b, however, has a much redder color than the field dwarfs, (further right on the plot), suggesting there is a large amount of dust in its atmosphere. Using the data at all three wavelengths were the planet was detected (1.7, 2.05, and 3.8 microns), Galicher et al. constructed a spectral energy distribution and fit planetary atmosphere models to the data. They found the planet’s effective temperature was between 600 and 1500 Kelvin. The planet’s mass cannot be constrained in this way; evolutionary models are needed instead, which depend on the unknown initial conditions. One set of evolutionary models gives the planet’s mass as 5 MJup. The other gives a range of 4-14 MJup, but 4 MJup is the most probable. Detections at more wavelengths and spectroscopy with higher signal to noise is needed to better constrain the properties of HD 95086 b.